If you like Nutella, hot dogs and more, you're in luck. Costco sold out of its nearly 27-pound bucket of macaroni and cheese. Known for deep discounts, the beloved wholesale club extends the same discounts to its iconic food court items and ready-made entrees. Costco members can score deals on bulk pantry and grocery items, as well as prescription eyeglasses. Some Costco customers are taking the meal prep trend to another level of interpretation. 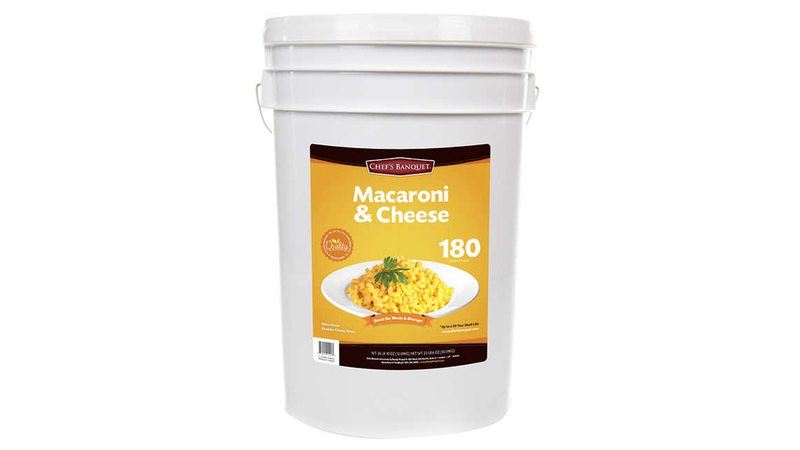 Last Friday, a nearly 27-pound bucket of macaroni, containing 180 servings, sold out on Costco’s website. The product comes with a price tag of $89.99, but considering it has a 20-year shelf life, the purchase is more of an investment. Although mac and cheese diehards will have to wait for Costco to replenish its stock, there are more deals to be had at the big-box chain. The nationwide wholesaler’s hallmark is its hefty discounts on grocery and pantry items, as long as customers buy in bulk. Take a look at some of Costco’s best deals that you can shop while waiting for the mac and cheese restock. Coconut oil and its myriad of uses — from lice remedy to makeup remover — have caught on in recent years. The multipurpose product is sold at Costco, where you get 84 ounces of organic coconut oil for $16.99. A heart-healthy alternative to butter, extra virgin olive oil makes a good pantry staple. Shoppers can buy 2 liters of Costco’s house brand extra virgin olive oil for $16.99 and use it for its shelf life of 18 to 24 months. The optical department is often an overlooked benefit of Costco membership. The chain accepts most vision insurance plans and sells a wide variety of name brand contact lenses, sunglasses and eyeglasses. Costco knows that weaving through the aisles of the massive warehouse is sure to work up an appetite, so each location is outfitted with a food court to keep up shoppers’ energy. True to form, Costco extends the same great deal on merchandise to its food — for just $1.50, shoppers can get a jumbo hot dog with a choice of toppings and a 20-ounce soda. Kirkland Signature — Costco’s house brand — sells just about every nut under the sun at a fraction of what nuts sell for at traditional grocers. For $14.99, shoppers can score 48-ounce bags of walnuts and almonds. No one necessarily needs a 6.6-pound bucket of Nutella for personal consumption, but if you’re a fan of the hazelnut spread, Costco does sell that amount for $21.99. Costco’s rotisserie chicken is one of the icons and signature products of the wholesale club. The chain sells ready-to-eat, 3-pound rotisserie chickens for an unbeatable deal at $4.99. It’s worth noting the price hasn’t been raised in years. Big families or roommates can find savings when shopping for toilet paper at Costco. As long as there’s storage space, members can spend $18.99 and get 30 rolls of two-ply bath tissue. Find out how to score Costco deals without paying the membership fee. Lenovo and others revealed the best new laptops at CES 2019.